Part of Dubrovnik which is really on a great location, close to the Old Town and still far enough, with an amazing view to the sea, is called Gorica Svetog Vlaha. 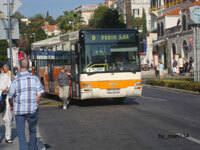 This part of Dubrovnik is situated 1-1.5 km from the city center and has great bus connection (bus number 4 drives every 20 minutes, the ride takes 5-10 minutes, ticket price is just 12,00 kunas / 1,66 euro and it's valid for an hour). On Gorica Svetog Vlaha you can enjoy in many cafe bars which are favorite among young people in Dubrovnik. The most beautiful beach in this part of the city is beach Bellevue - beautiful sandy-pebble beach. If you want to book the accommodation close enough to the Old Town and not to use the bus, definitely Gorica Svetog Vlaha is the right choice for you. Also, you can use local bus service Libertas. There is bus station on Pile from where most of the bus lines leave for all parts of the city. Ticket price is 12,00 kunas (1,66 euro) and it's valid for an hour. You can buy ticket at any tobacco shop (price 12,00 kuna = 1,66 euro) or in the bus (price is 15,00 kuna = 2,00 euro).